Models 140, 340, and 540 feature tipping loads of 1,900-5,100 pounds when not articulated and rated operating capacities of 950-2,550 pounds. 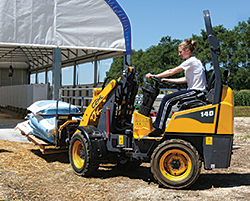 Articulated steering allows for turns up to 45 degrees, which enables the compact loaders to navigate confined spaces, minimize damage to sensitive surfaces and reduce tire wear. The bucket and tires follow a constant turn radius, so the rear tires of the loader follow the path of the front tires.